Alive & Amplified is delighted to premiere the brand new track ‘Fiat Five Hunner’ from Dunfermline’s Amy Lou. We caught up with her to chat about the new release, influences and future plans. A&A – Hello, Amy Lou! Firstly for those who don’t know you, tell us a little bit about yourself and your music. Amy Lou – We like to regard it as fiesty indie pop with a wee Scottish growl. We’re from the Bonny land of Dunfermline and are formed by myself, John Huskie on bass, Jakob Archibald on guitar, and Joe Kane on drums. 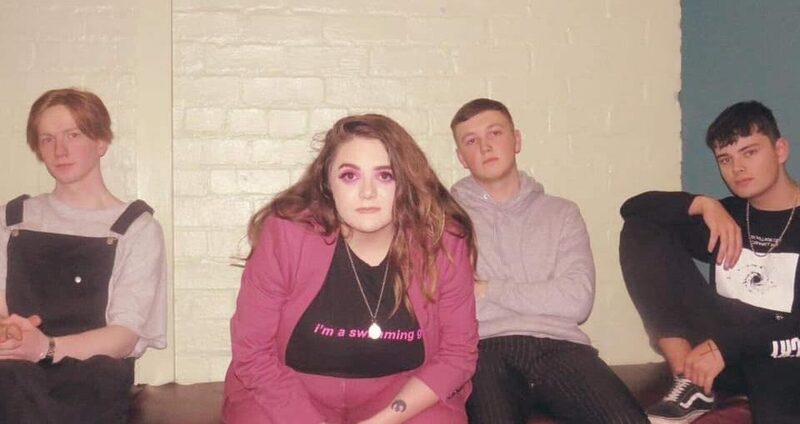 A&A – We are delighted to have the premiere of your newest single ‘Fiat Five Hunner‘ Tell us about the track? Amy Lou – So Fiat Five Hunner is all about how a relationship can either build you or break you. It’s personally my favourite track of ours to play live – it’s got a strong drive and intensity. Lyrically I think it’s my favourite song I’ve ever written. A&A – The single is out on Saturday(19th Jan) on Vadana Records. How did you get involved with the label? Amy Lou – So the label work very closely with Perth College, John and Jake actually study up there so it worked quite nicely. We already had the track in place it was just the case of someone helping us giving it a push. A&A – What is your songwriting process? Amy Lou – Songwriting for me starts from a poetry stance, I have always written poetry and short stories from a young age so songwriting comes to play. A lot of my lyrics comes from things that people say to me and I tend to go that’s brilliant I’m going to use that. A&A – Who are your influences in music? A&A – You are having a single launch party at PJ Malloy’s in Dunfermline on 26th January. Are you looking forward to a hometown gig? A&A – What should people expect from the live show? Amy Lou – Some thick guitar fuelled singalongs, plenty of opportunities to bop about and go a bit mental, with a hint of drag on top. A&A – You are also playing King Tuts and Sneaky Pete’s soon. Are you looking forward to these dates? Amy Lou – Massively, it’s our first time playing both venues. At King Tuts we’re supporting Indigo Velvet who I’ve listened to for a few years – funnily I saw them at PJs as well – so I’m really excited to share a stage with them. We’re also headlining Sneaky Petes joined by some top-notch supports. A&A – What’re the plans for the rest of 2019? Amy Lou – We have a very cool music video that goes along with Fiat Five Hunner that’s coming out next month which will bring the song to life in a whole new way (no spoilers) , we have a few songs kicking about to release – we’re looking forward to a summer of festivals and some big shows in between the madness. A&A – If you could describe your music in 1 song what would it be?